Hortus Camdenensis | Malus baccata (L.) Borkh. Fully-hardy, vigorous, rounded tree with oval leaves, to 9cm long, and numerous white flowers in spring, followed by long-stalked, red or yellow fruit, to 1cm across. To 15m. [RHSE, Hortus, Hilliers']. 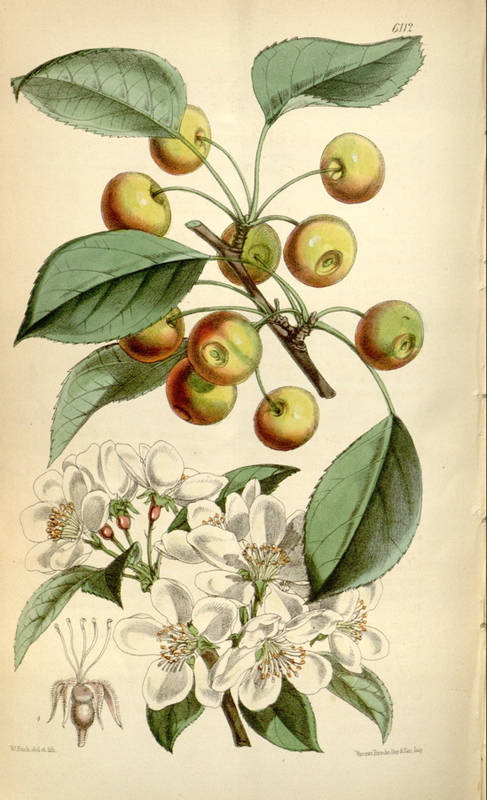 See also Malus baccata (L.) Borkh var. sibirica C. K. Schneid. This is almost certainly the same plant. Introduced to Kew Gardens in 1784. ‘This charming tree, though so long known in cultivation, has never before been well figured in this country. It has a very wide distribution; in Siberia it occurs in the eastern districts of Lake Baikal and in Dahuria; thence it passes by the Amur river north of China into Japan, whence we have numerous specimens. In the Himalaya it extends from the Indus to Kumaon, at elevations between 6000 and 11,000 feet, entering the Tibetan region of Piti; and it was gathered by Dr. Thomson and myself in the Moflong woods of the Khasia mountains, at an elevation of 6000 feet. It varies very much as to the pubescence of its parts; the Siberian and Japanese specimens being almost wholly glabrous; the Western Himalayan having more or less pubescent calyces, pedicels and petioles, and sometimes young leaves beneath; whilst those from the dry region of Piti, on the border of Tibet, are as glabrous as the Siberian; and those from the very wet region of the Khasia are the most pubescent of any. This correlation of humidity with pubescence is not unusual in the vegetable kingdom.’ [BM t.6112/1874]. Introduced to the gardens before 1843. Listed in all published catalogues [T.789/1843]. Pyrus baccata Hort. ex Hoffmanns. (1824) = Pyrus rubicunda Hoffmanns. 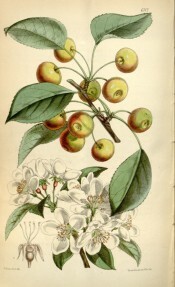 More details about Malus baccata (L.) Borkh.